February 26, 2017 - Shifting to clean and renewable energy presents a very strong potential for oil-producing GCC countries to maintain global leadership in the energy sector despite the current market slowdown, while reaping massive savings of up to USD 87 billion as well as potentially reducing up to one gigaton of carbon emissions, according a new report. 'Clean Energy in the GCC' highlights the array of benefits for the GCC economy and the global environment if the region would focus and take advantage of the growth potential in clean and renewable energy. The report was released recently by Orient Planet Research, an Orient Planet Group venture. Scaling up renewable energy in the GCC countries would reap multiple benefits across the region, the report noted, adding what Gulf countries would stand to gain in terms of job creation, fossil fuel savings, and reduction in carbon emission, among others. Achieving the RE plans for the region's electricity sectors, for instance, could result in an overall savings of USD 55 to 87 billion, depending on oil and gas prices. Carbon emissions could also be reduced by one gigaton (Gt) by 2030, leading to an 8 per cent cut in the region's per capita carbon footprint. In the case of Saudi Arabia, the region's largest consumer of fossil fuels for power production, the Kingdom would save around 170 million barrels of oil and gas resources by 2030, or 44 per cent of the GCC-wide savings. The IRENA analysis indicates that the fulfillment of renewable energy targets can cut power sector fossil fuel consumption in Saudi Arabia by 25 per cent by 2030. 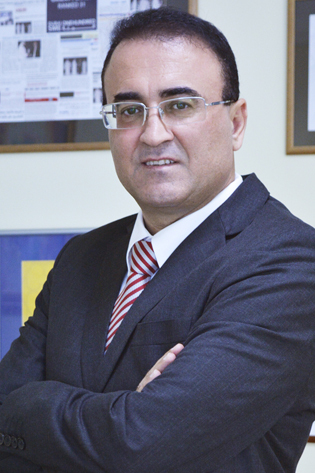 Nidal Abou Zaki, Managing Director, Orient Planet Group, said: "Rapid industrialization, population growth, and an increased rate of water desalination are all contributing to burgeoning energy demand. Right now, more fossil fuels are being used to meet the rising energy requirement but there is now a growing need to transform towards a more sustainable future. The prospects are bright for GCC countries in this regard especially because the region has a strong potential to be a net exporter of electricity generated from solar power in the future. This is only one aspect which GCC governments can capitalize on moving forward."  The development of fossil fuel reserves and their exportation has led to wide economic growth, bringing prosperity and development to the region. The GCC economies' position in global energy markets over the past 40 years has been shaped by their role as oil and gas producers. Rapid socio-economic growth over the past decade is positioning them as one of the world's highest growth markets. "However, now is the time to study and explore sustainable alternative. Pursuing renewable resources in the Gulf is highly practical as it is as richly endowed with renewable resources as it is with hydrocarbons. The region, as the report notes, boasts of abundant year-round sunshine, the space to develop large solar power plants, significant wind and geothermal resources, and biomass derived from urban waste. There is no better time to pursue clean energy than now when the industry is experiencing significant growth worldwide," Abou Zaki added. In terms of job creation, meanwhile, the report highlights that the estimated 5.7 million employed directly or indirectly in the global renewable energy industry in 2012 could triple by 2030, with the solar segment expecting to account for 85 per cent, followed by waste-to-energy at 14 per cent. 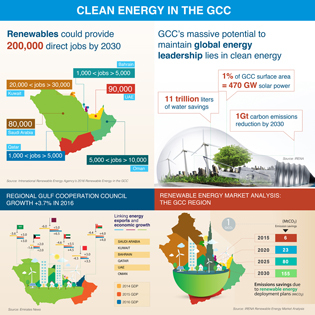 The report also cited that renewable energy will help GCC countries produce 116,000 jobs annually. Such considerable job opportunities are crucial as global economies continue to struggle with economic boom-bust cycles. Unemployment and its associated social and economic impacts remain a key concern and an instrumental driver of public policy. Moreover, RE power generation is becoming more cost effective. Improving technology and growing competition have seen RE costs drop dramatically. In addition, solar power generation fits very well with demand patterns in a geography such as the GCC, where air conditioning dominates the electricity demand curve. Overall, the report states that RE offers the region an important opportunity to be at the forefront of optimizing clean energy to efficiently and effectively meet increasing power demand in a sustainable manner.